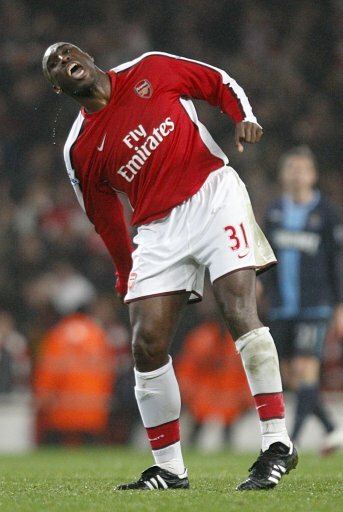 Sol Campbell Set For Third Arsenal Stint? With Sebastien Squillaci twanging his hamstring against Leeds over the weekend, the number of senior centre-backs that Arsenal currently have at their disposal stands at two – and that’s if you’re willing to count Laurent Koscielny. Long-term linkees Gary Cahill, Phil Jagielka and Per Mertesacker have, as per, already seen their names emerge as potential targets, though the Daily Express seem fairly certain that an altogether more under-whelming candidate may be in line for a shock return to the Emirates in the increasingly portly guise of veteran ambler Sol Campbell. Apparently Sol is unhappy with his peripheral lot at Newcastle and Wenger, enticed by the prospect of a free transfer, may move to re-sign the former Gunners defender on a short-term deal, similar to that which he signed at the arse-end of last season. “‘If we only have two centre-backs then that cannot work with the number of centre-backs we have. '” hah, i think you got something wrong, sir. Wow. Sol Campbell’s been horrible lately. Maybe that’s due to being in a club with Joey Barton but I’d rather hope Wenger isn’t willing to risk it. Especially considering how woeful Arsenal’s defense has been and how desperately they want to prove to Fabregas that he should stay with Barca-Lite. Is Sol trying to outlast Sir Alex? He ought to have been kept in the lineup. Now it’s just stupid to resign him just a few months after.